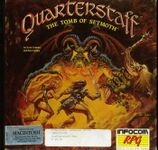 Quarterstaff: The Tomb of Setmoth is an interactive fiction computer role-playing game developed by Scott Schmitz and Ken Updike and released by Infocom for Macintosh in 1988. The game features a text parser, graphics, a dynamically updated map, and a graphical interface that incorporates Mac OS hierarchical menus. Quarterstaff: The Tomb of Setmoth was based on Quarterstaff, a game released by Simulated Environment Systems in 1987. Activision purchased the rights to the game from Simulated Environment Systems in 1988, and released the game with improvements including color graphics, an upgraded interface, and writing input from Amy Briggs. Versions for the Apple IIGS and IBM PC were announced but never released. A planned sequel titled Storm Giants was never released. The player takes the part of Titus, a former blacksmith sent by the Druid Council to explore the remains of an underground colony of druids who vanished without a trace. During the course of his adventures, Titus may befriend other characters and persuade them to join his party. Character skills improve with practice, and the game tracks the hunger, thirst and tiredness levels of characters.